Slowly, slowly… as Winter grinds on I’m getting back into the swing of things. I’ve had to take winter off from everything but the most simple crafting projects, which is my custom every year due to my company’s yearly bookkeeping obligations. I did make my usual holiday purse ornaments for my girlfriends and family members and for the third year in a row, failed to take a picture of even one of them. 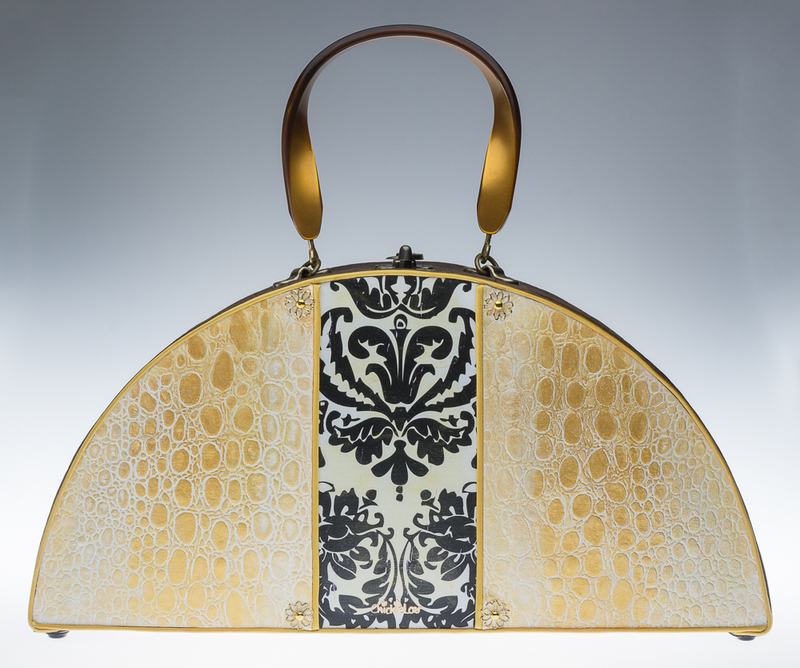 This purse, and the six to follow were ones I made last Fall. Here we have Andrea. I love cork, as I have mentioned many times here. I put a light white wash with gold sparkling accents on the front cork, which is padded. The handle is “New Old Stock” and acquired on eBay. The trims are all synthetic leather, making it 100% Vegan, to the best of my ability to know. It turned out lovely, but there is one drawback to this purse and many other small purses that I have made in the past: it’s too small to hold most current cell phones. Alas, one needs a pocket for that, which sort of defeats the point. But I am still happy with how it turned out. 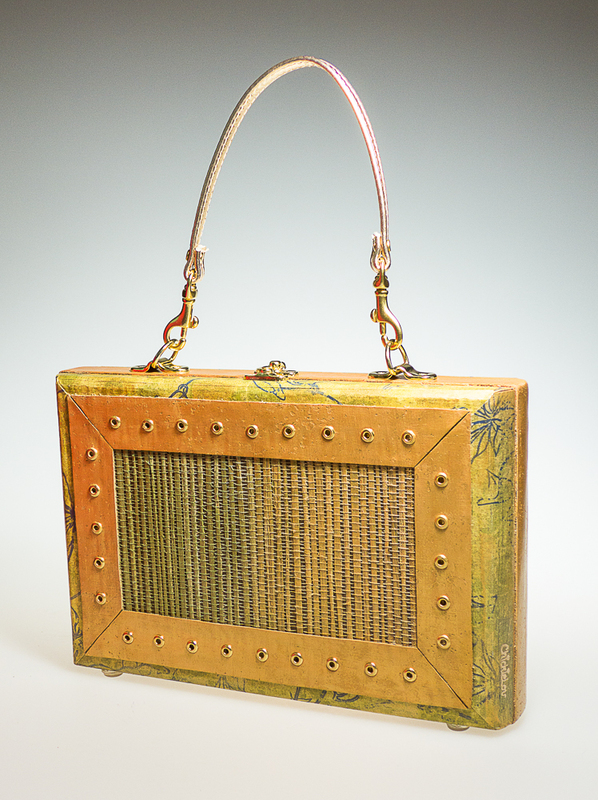 Here is another “Betsy” bag. 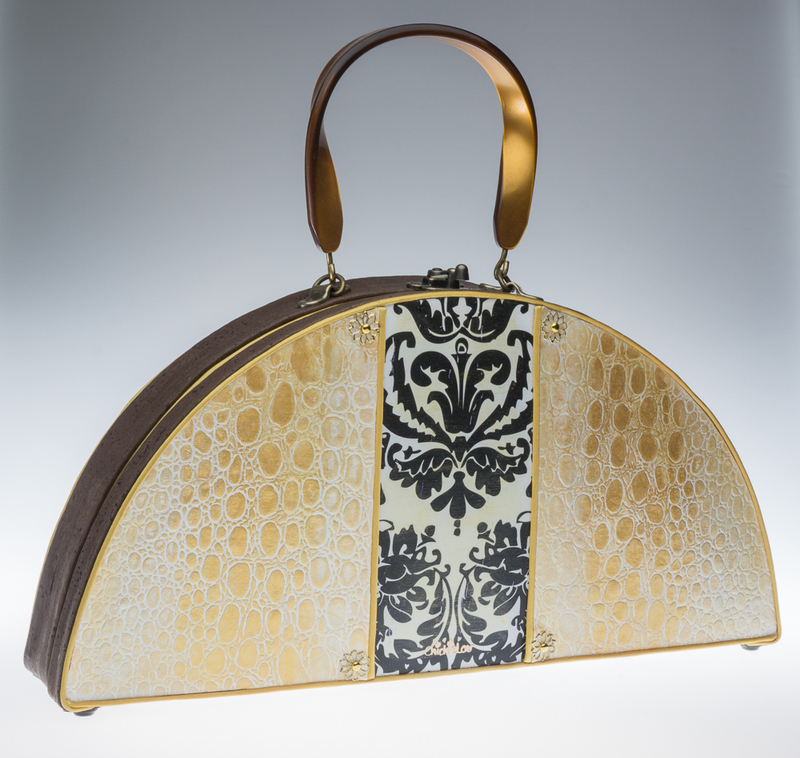 The first “Betsy” bag was made for a friend facing a challenge. This Betsy purse is named for my step-sister who gave me (one guess) MORE CORK! This in the form of cork ribbon (which I must add was wrapped on the package containing a gift of a GORGEOUS vintage handbag). The ribbon was so darn wide and incredible, I was able to wrap the entire side of a box with it! I throw away NOTHING. This was one of those subtle-bags-on-the-outside-but-check-out-the-explosion-inside! Yowsa! Check it out. Here is Maiden, named for the collage image inside of the purse. I purchased the image on Etsy. I love the native, Caribbean feel of it. I wish I knew more about it. Again, we have the persnickety appliques on cork (see the sides). But I learned a lot from the previous purse I made. If anyone knows anything about this image, I’d love to hear from you. I added all the gold elements to it. That’s not an optical illusion. The paint on the edges is “hombre”. Hello, all! And Happy soon-to-be-Spring. So, this being a hobby of mine, I hope you will understand my absence. We run a small graphic design business and I am the bookkeeper. From November until late February or March, I’m working for the accountant and the tax preparers, and making purses when I have free time, or when I’ve had just about all the bookkeeping that I can stand! And then I need to work with my husband to find time to get these babies photographed. And here we are, another winter done and gone. It seems completely appropriate to start with a purse I made late last summer called “Holiday”. This might be one of my personal favorites. 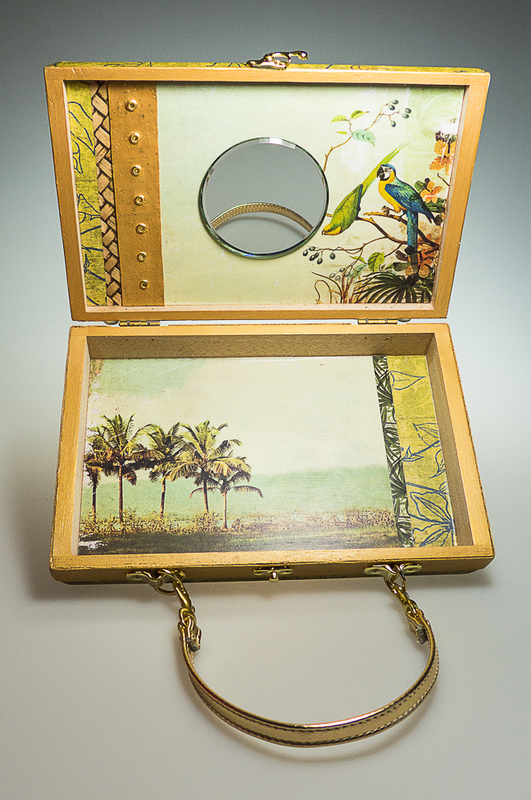 The cigar box I used was a perfect size and shape (7″ x 7.5″ x 3″). Let me tell you however, in spite of how fantastic this turned out, it was also one of the most challenging purses I have ever made. Why? Because finding a fairly non-toxic glue that adhered the G.D. appliques to the G.D. cork surface without making a mess was just about impossible. Shoe-Goo, E-6000, seemed like the best bet. But it DID NOT adhere it. It was a nightmare, and especially upsetting because I could see the purse’s loveliness, I was becoming attached and the darn things would not stick. I’m sure if I tried hard enough I could still pull them off. But I won’t. The winning glue was Gorilla Glue. But given that it requires water, it was not the cleanest experience. Anyway, it will survive my fashion demands. But after making “Holiday”, I definitely needed a vacation. More cork fabric. This time stenciled and hand painted with a “trellis” design. The handle is what is nifty with this one. It’s a vintage leather briefcase handle. And it’s meant to fold down flat, neatly tucked next to the purse in the back. The cross-over strap is removable for another option. Now, you don’t see the handle. Here’s a fun one. Another one of these gorgeous World Market wrapping papers. But I also stenciled Dimensional Magic in the shape of flowers over the paper giving it a textured, almost wet look on the surface. The sides of the box are covered in cork fabric and then I added that floral trim over the cork plus on the handle. It’s amazing, but that is just paper. It looks like gold metal. I am constantly looking for neat and interesting paper. This one happens to be a paper placemat, made for one time use. These are from Hester and Cook and they are so lovely. Almost too pretty to eat off of. They come in a pad of tear-off sheets, and I will be making more of these! 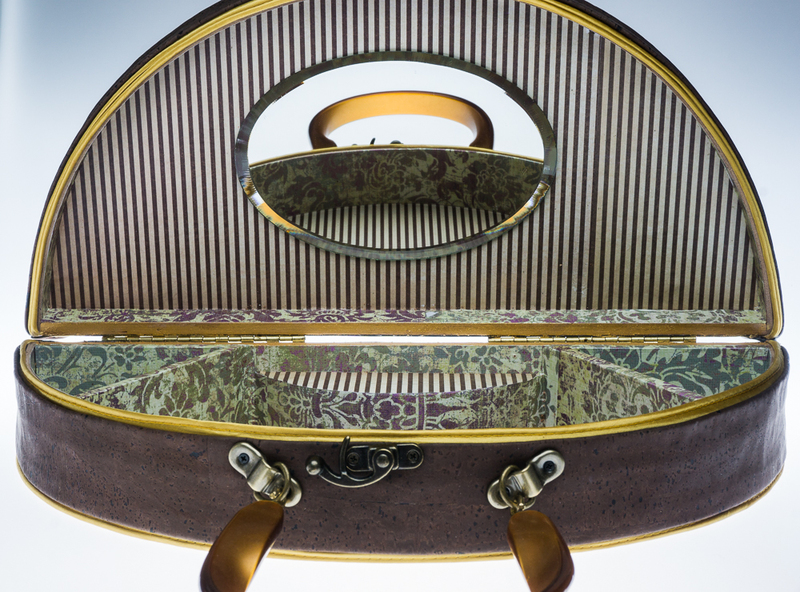 The interior is a collage of images that I hoped would be an unexpected surprise when the purse is opened. I’ve also been playing some more with cork fabric, which is wrapped around the edges of the purse and rivets added for decoration. I’m calling this Placemat #1 because I have another one to show you next. Yep, that’s a placemat on there! So here we have Obelisco. It’s a large purse. The reptile “skin” on the front and back is paper. (No animals were harmed… etc.) I am also experimenting with cork fabric. That’s the brown colored material you see on the sides. Again, the desert dry air messed with me a bit. The box was in my closet drying out and by the time I got around to finishing it, the box no longer closed completely. My only idea was to buy supply of gold colored corded fabric piping and use a few layers of it around the edges of the box to close the gap. I decided I really liked the way it looked and I will be using it on other purses in the future. It gives it a nice finished look. Inside, the box came with some partitions that confined the cigar product to a small area of the box. I flipped those over, decoupaged everything inside and it made some nice compartments to keep things organized. I like how it turned out. If you are lucky, you know a friend like Karie. She’s sweet, funny, caring, and she’s got great taste. And she likes the color green. She also makes you think about things and pushes you to stretch and grow. So it is only fitting that by making this purse, I have learned a LOT! The cork was a new thing for me. And even when I asked her “Do you like cork?” and she said “No”, I had to find a way to make it work. So, I made the cork gold. It plays like leather, so I decided to teach myself a thing or two about setting studs. I like the look of eyelets, and had them on hand. And there you have it. Dressy and sweet, just like Karie is. Though the handle is pretty, I’d like a slightly thicker handle on it, and so I will allow one guess who is now exploring making her own purse handles. I am up for the challenge and the growth. Karie would really have it no other way! 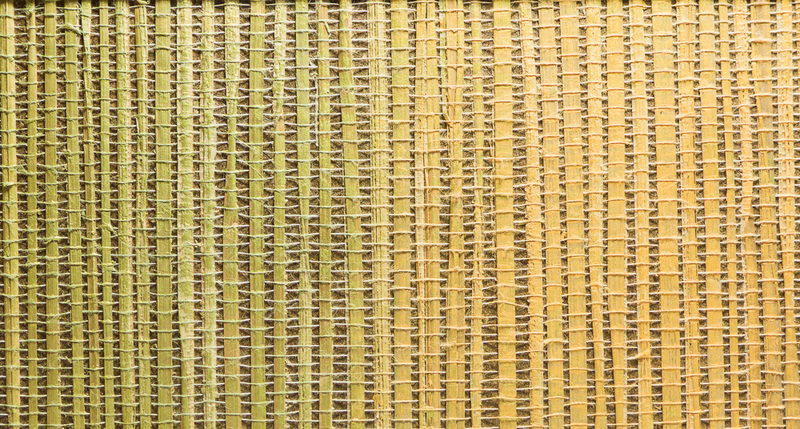 Image shows front, using grasscloth, cork, and eyelet rivets. I wanted the interior to feel like a mini-vacation.